Cave Creek Canyon is located on the east side of the Chiricahua Mountains of Southeastern Arizona. 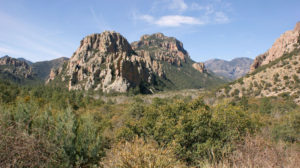 With the base of the Chiricahuas at about 3,600 feet (1,100 meters (m)), the range includes approximately 6,000 feet (1,800 m) of elevation change. Grasslands and desert cover the base of the range, with Ponderosa Pine and Douglas-fir at the highest elevations. Wrapped around Cave Creek, Cave Creek Canyon is considered by many to be the crown jewel of this magnificent mountain range. It is the largest and most biologically diverse canyon in the Chiricahua Mountains. It is a favorite haunt of bird watchers and nature lovers, and is the home of the American Museum of Natural History’s Southwestern Research Station and the small communities of Portal and Paradise. Cave Creek Canyon is one of Conservation International’s 34 Global Biodiversity Hotspots. It provides habitat for approximately 370 species of birds, 170 species of butterflies, hundreds of plant species and over 70 species of mammals including ocelots, collared peccaries, mountain lions, coatis, black bears, ringtails, and white-tailed deer. Species lists for birds, mammals, amphibians, reptiles and invertebrates can be found on the website of the Southwestern Research Station. The earliest evidence of human activity in the vicinity are Clovis archeological sites, such as the Double Adobe Site in the Whitewater Draw tributary of Rucker Creek north of Douglas. Subsequently the Cochise, another pre-ceramic based culture spanning 3000 – 200 BCE, was defined from sites around the Chiricahua Mountains, including Cave Creek Canyon. Following the transition to ceramics, diagnostic ceramics characteristic of Mogollon culture and its local variants, the Mimbres culture, are found spanning the period from 150 BCE – 1450. The influx of other indigenous peoples, such as the Chiricahua Apaches, including the leaders Cochise and Geronimo, occupied the area until forced removal in the late 19th century. A one to two mile wide band of sedimentary rock running southeast to northwest from south of Portal through Paradise and up to the Dos Cabezas Mountains is the source of mineralized deposits. The first recorded mining claim in the Chiricahua Mountains was the Hidden Treasure claim filed in 1881 and mining has continued intermittently to the present with the greatest periods of activity occurring in the 1920s and 1950s. The largest of the mines developed in the Chiricahuas was the Hilltop mine which consisted of 3 interconnected levels totaling 6,098 meters (20,007 ft). In the southwestern United States and northwestern Mexico lies a region boasting the highest biodiversity in inland North America. Isolated mountain ranges topped by 10,000-foot peaks rise from intervening desert valleys and grasslands, prompting the nickname “Sky Islands.” A unique array of geographic, topographic and climatic influences creates an extraordinary variety of plants and animals here, many imperiled or found nowhere else. Learn more about the Sky Islands from the Sky Island Alliance and from the Center for Biological Diversity.